Modern point-of-sale (POS) systems have made contactless and mobile payments possible, as well as making it easier to chart sales trends, track profits, log customer information, control inventories, manage pay roll and deal with suppliers. RetailBiz spoke to Craig and Darren Cookesley, the brothers behind POS solution Solemate Software, about why implementing a decent system is so important and the boost it can give a business. Craig Cookesley said a good POS system can save retailers money, as it leads to better stock visibility and purchasing power. “Ideally a retailer should be seeing return-on-investment (ROI) through better margins,” he said. “Retailers need visibility so they are not operating blind. This will enable them to reduce stock holds. 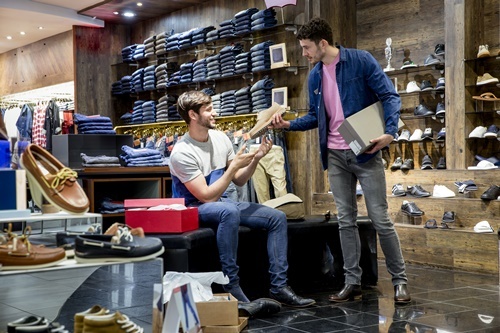 Solemate specialises in solutions for footwear and fashion retailers, and stock control is an important part of its unique offering. The system provides real-time data across multiple store locations, which means retailers have a clear view of their business, down to the availability of a certain product size or colour. Solemate specialises in solutions for footwear and fashion retailers. This reporting capability led Andrew Burns, director of footwear chain Suna Shoes, to switch to Solemate 10 years ago. Suna Shoes has seven bricks-and-mortar locations across Queensland and an online store, and Burns said Solemate helps the company keep track of what’s selling and what’s not. Along with stock control, Solemate also gives retailers a clear view of their margins, which Cookesley said is something successful retailers focus on. “Good retailers know exactly what margin they’re getting and they’re always monitoring ROI and net profits through their software. Having a POS system that tracks product margins allows retailers to be smart when reordering or purchasing new stock based on past sales trends. Solemate provides in-depth ROI reporting by product style and brand, right down to size and colour. It also provides valuation reporting by style, season, store, supplier and department—all valuable information for retailers making purchasing decisions. “If you buy 12 pairs of shoes, it’s not the profit on the first pair but the last pair that tells you how that shoe went. You might have sold eight pairs but if you have to sell the last four at half-price, this means the margin drops. Solemate caters to a range of clients from single location retailers to 50 store chains. Rather than offering a one size fits all solution, the company writes software for its clients. “Different retailers have different needs, so we write software depending on what they want,” said Cookseley. For a small business like Suna Shoes, which is not in a position to build its own platform, this personalisation is very important. As is the Solemate commitment to customer service, which includes 24/7 phone support and on-site installation and training anywhere in Australia. This was one of the reasons Burns chose Solemate as Suna Shoes’ POS solution. “Craig came up from Melbourne and rolled us over [from a previous system] with very little headache. He made it as smooth as possible and went around to all our stores—he even flew to Cairns—and helped up set up,” said Burns. Since starting his first POS business in 1991, Cookesley said he has seen changes in the way retailers build customer loyalty, with personalisation becoming more important. Solemate tracks customer spend to create a history of each shopper, which retailers can use to accurately target shoppers based on past behaviour. For example, if a retailer knows a customer likes a specific brand, they can send a targeted email blast when a new range is available. Darren Cookesley said the combination of e-commerce and in-store shopping is a big focus for Solemate, as retailers need to see the entire picture—both on and off line—when it comes their business. The company is also working on introducing buy now, pay later integrations in response to demand from customers for this service.